First of all, today is Saint Patrick's Day, which means that Patrick Brontë (or rather one Patrick Brunty or Prunty), father of the Brontës, was born in a small cottage in Ireland 241 years ago. On Twitter, Hilary Robinson refers to him as being her 'favourite Patrick'. Yorkshire Post features author Michael Stewart, who will be in Haworth later today. The Yorkshire Post also mentions HRH The Duchess of Cornwall's enthusiasm for the Brontës, particularly after her recent visit to Haworth. She is a self-proclaimed Brontë addict, an avid reader and patron of several literary charities. Artist Celia Paul writes about her work for Financial Times and brings to our attention a lovely painting. Another painting, “The Brontë Parsonage (with Charlotte’s Pine and Emily’s Path to the Moors)”, relates back to the time before my father died, when he was Bishop of Bradford. The bishop’s house looked towards Bradford from one side and the other faced towards the Yorkshire Moors and Haworth where the Brontës lived. My father used to drive my mother, Kate and me out to Haworth on a Sunday afternoon and we would walk to Top Withens (the abandoned farmhouse that is said to have inspired Wuthering Heights). I went back to the parsonage in February last year to make studies for a painting. 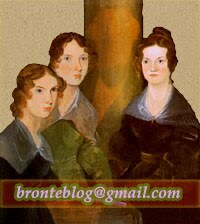 I’ve always felt a special bond with the Brontës (as all my sisters do) because of belonging to a family of creative sisters, daughters of a clergyman also. When I visited it, the boughs of the great trees in the garden were leafless and echoing with the cawing of rooks. It was very silent and felt haunted. It was easy to imagine Charlotte looking out of her window towards the gravestones in the churchyard and the clock on the church tower: constant reminders of the brevity of life and the immortality of the soul. I sensed her longing and the huge pine trees in the churchyard seemed connected to her “pining”. Behind the parsonage is a glistening pathway to the moors: this was Emily’s escape route towards inspiration, “a chainless soul”. The Irish Times has published an obituary for author Val Mulkerns. She had a much happier experience in the lavender-waxed halls of the Dominican College on Eccles Street. She fostered her love of reading in its junior library, encountering books such as Jane Eyre and Wuthering Heights for the first time. The Chatanoogan tells a funny anecdote about writer Madeleine L'Engle. At the time, she was working on her 18th book, “A Wind in the Door,” which was evidently inspired by the growing dependence of man on computers. She apparently did not like how at places like banks, names were being replaced with numbers. Bustle recommends Jane Eyre as one of '21 Classic Books That You Can Read For Free Online'. Le Devoir (France) mentions that writer Sarah Perry is a Brontëite. The Pine-Scented Chronicles posts about Wuthering Heights.